In my last post I promised to be more regular here, then at the last moment we decided to visit India. To say I was homesick would be putting it mildly. We decided to squeeze in the trip before Ishaan’s school started. Some of you asked to post pictures of food/garden back home. So decided to post this. We mostly stayed in Bangalore this time with few days trip to Belgaum and my hometown Kodkani in between. Kids had a fantastic time with family. Ishaan bonded immediately with my brother’s 3 year old. It was such a delight to see them moving around everywhere hand-in-hand. Before we left from here, my brother asked me what I wanted to do in India. I said spend time with you all and eat a LOT. While my parents made sure to feed me every one of my childhood favorites, my brother took me to all his favorite restaurants in Bangalore (we ate out twice a day sometimes!!). When we landed, my brother had loaded the freezer with all kinds of fish. Aayi made this yummy spread on the second day. 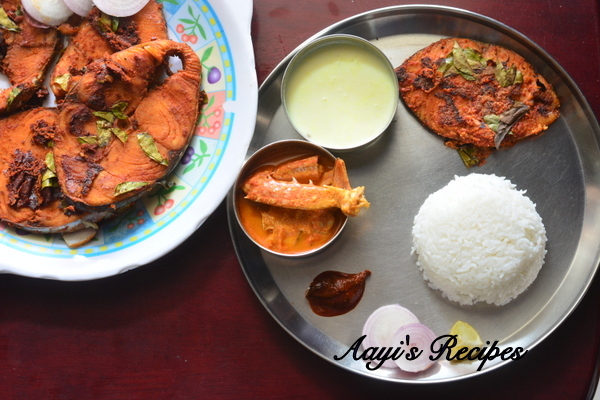 Above thali had spicy fish fry, crab gravy(kurle ambat), buttermilk kadi(taka kadi), pickle, rice. Although mango season was over, we could find some in the market of Neelam variety. Kids loved them. We enjoyed them in ambe humane one day. I had all plans of clicking pictures of the food we had in restaurants. But whenever we went out, we all got busy in managing 4 little ones, it was a miracle that we could eat anything. After few times of my 15 month old throwing food all over me, we decided to take the booster seat to all restaurants. That was such a big help. So whenever we went out, I just forgot all about camera and concentrated on enjoying great food. It is rainy season in India. That meant we could get all the specialities of this season. 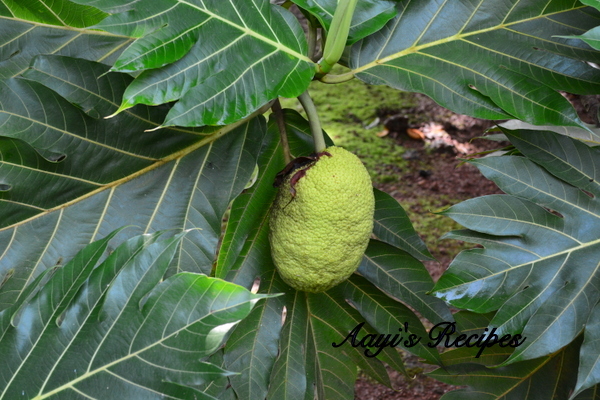 Our breadfruit tree was full of breadfruits. 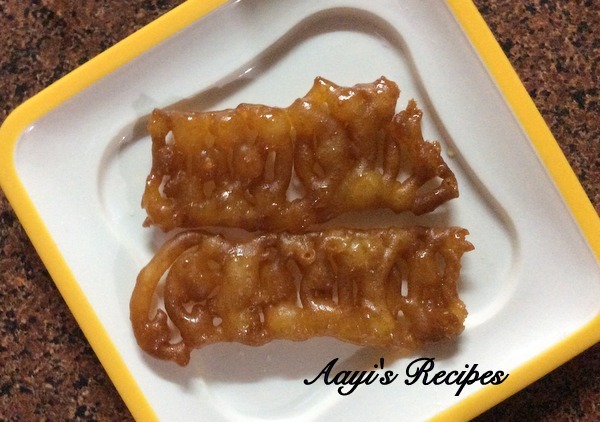 My all time favorite with these is the phodi, so easy to make and delicious. 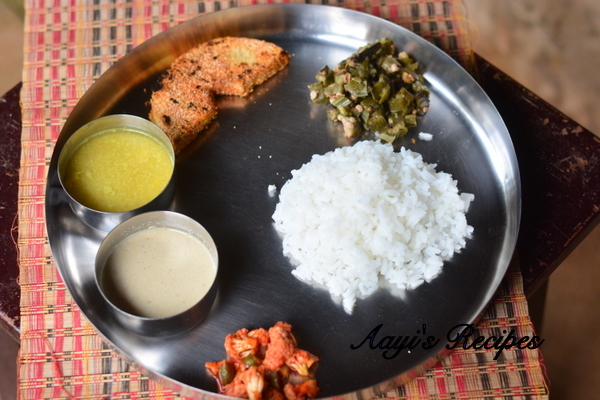 Above vegetarian thali had cauliflower pickle, limbe saru, varn, phodi, bhende upkari, rice. Whenever we visit my parents, they make these lovely baskets out of jackfruit trees and make hittu/khotte. Ishaan had a great time watching my mom make these. 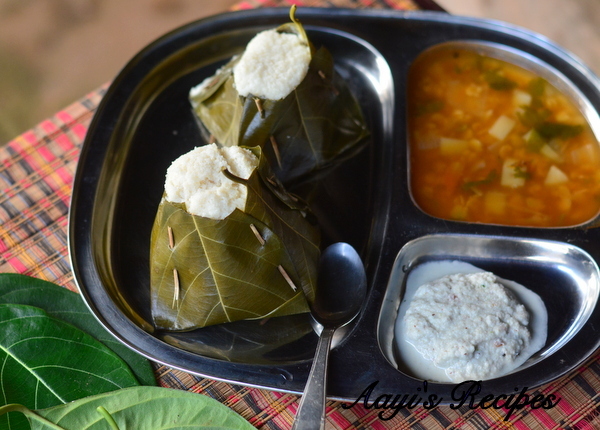 The pillowy idlis wrapped in these leaves were to die for. 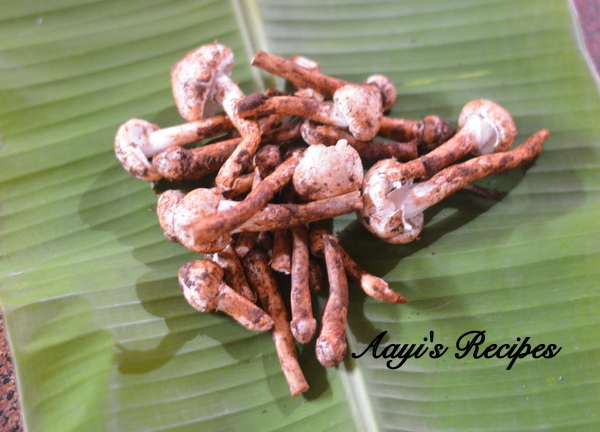 Although we stayed only couple of days in Kumta, we were lucky to get the naturally grown mushrooms. These are big delicacies during the season. They are sold by hundreds. My parents frontyard had a lot of turmeric leaves, our neighbors shared some from their garden too. So kadamb was on the menu one day. My maternal uncle(mama) came visiting us one day and he sent us very fresh jilebis from Sirsi. These are sold only one day a week and they are just out of this world when enjoyed fresh. 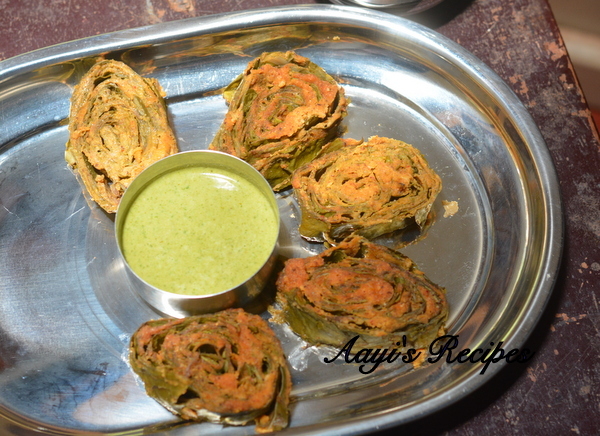 For me, rainy season means enjoying lot of pathrode and ankre tambli(will post soon). No matter how busy she is, aayi makes sure to prepare this combination for me. 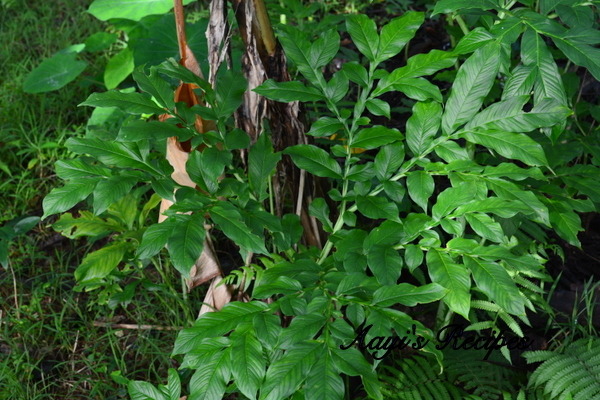 Pathrode leaves were abundant in our garden. 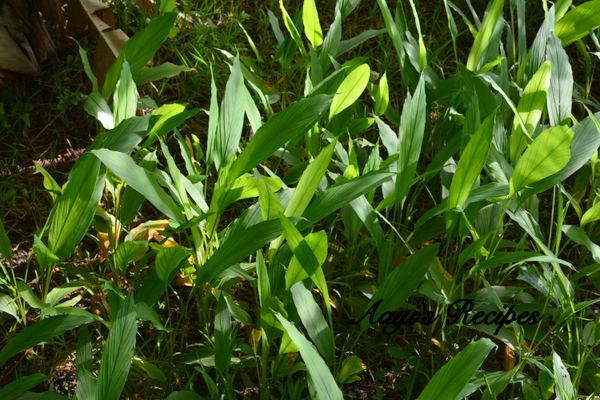 Ankre are different leaves available during the season. 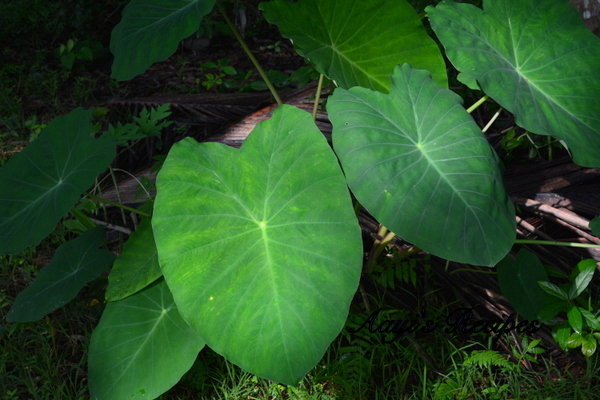 The garden was full of elephant yam/Surnu/Suvarnagadde plants. The plants grow wherever the roots are. 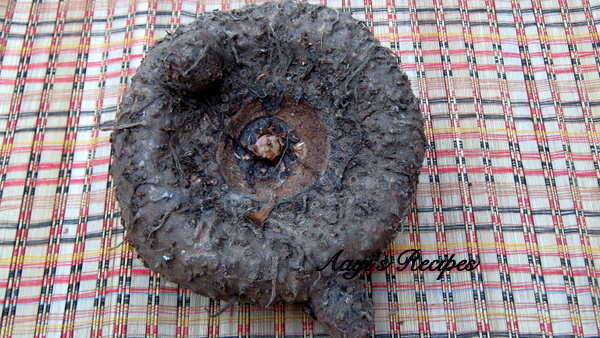 Only few of these will eventually have big beautiful yams (shown in below picture). My toddler has a serious sweet tooth. 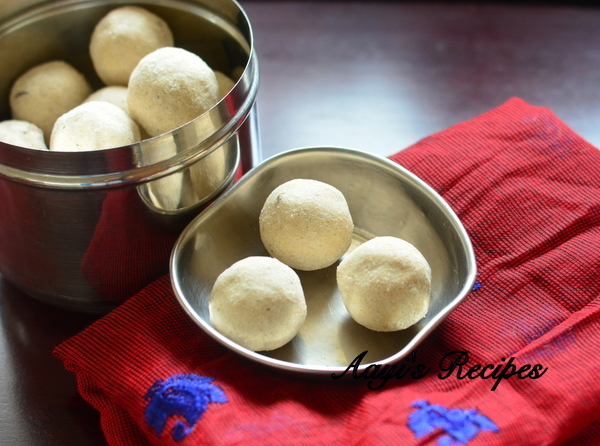 These wheat flour laddus(ganva guli/churmundo) were perfect for him. Any time he had melt downs, he would get a guli and he would sit happily for a while. Thank you shilpa….. You did this with toddlers …bravo! Mouthwatering of course. We ate at Vaibhav restaurant …. Divine .sea food …but next time I will ask your recommendations. But you have your parents who will pamper u why bother to eat out! What can I say? Shilpa thank you for sharing these images. The mushrooms from the monsoon thunderstorms are a distant memory….. Thank you so much for posting these pics, Shilpa! Filled me with such nostalgia… My aayee has apparently stored all kinds of mango dishes for me in the freezer 🙂 Yesterday I was suddenly struck with such craving for paize and bhajji dentya raandai but that’s still 4 months away, but thank you really! Wow! The first picture, its so very beautiful! Thank you for sharing all these pictures . Awesome work, splendid job indeed! 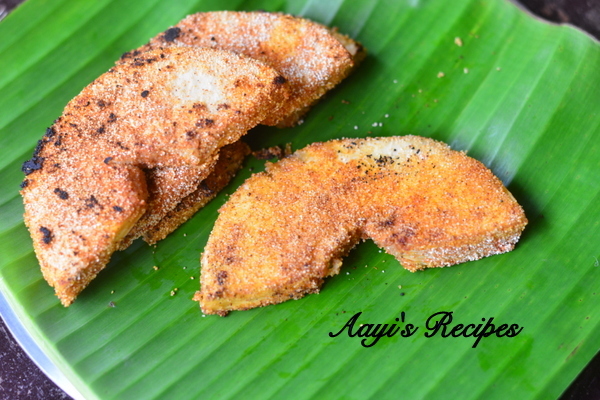 aayirecipes rock!! Well, I am a GSB and fond of home cooked konkani cuisines. BTW, aren’t those Jilebi’s from Nayak Hotel, Sirsi? They are finger licking delicious. All this food, I would like to know and taste myself! 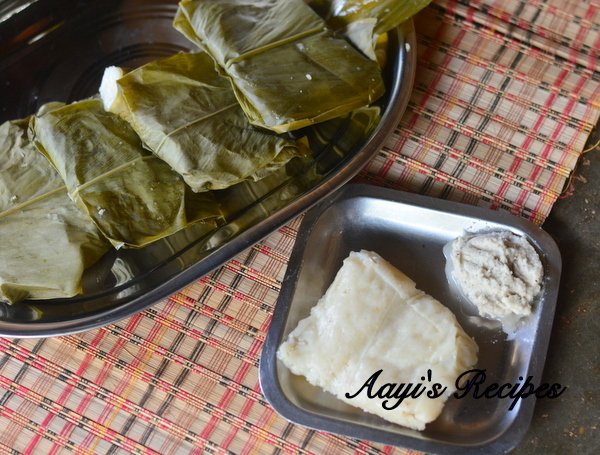 I am intrigued by the idli batter steamed in jackfruit leaves! Do they have a different flavour? Glad you could manage an trip and catch up with your family and Aayi! Anita, thanks. 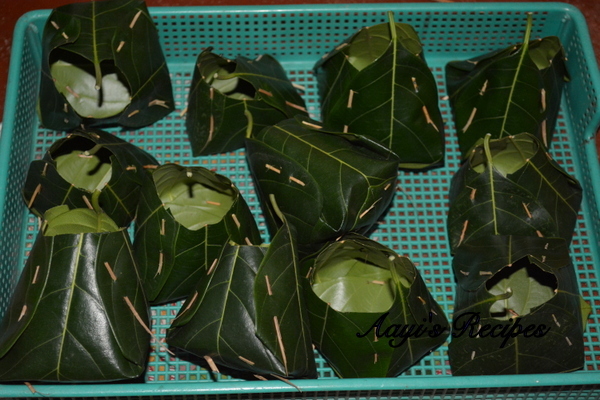 It gets a distinct aroma from the steamed jackfruit leaves. Many times it is available in Mangalorean restaurants. I think you will love them. Shilpa, this is mouth watering! I can only wish to relish these sometime in future. I was thinking of khajya-kaadi(flour sticks dipped in gingered jaggery). Is that available in your area? I’m guessing you are from around Karwar. Shilpa,I’m from Mumbai but now in NY- where exactly is this region? I would like to take my parents there next trip 🙂 – You’re a gifted writer.You must consider publishing a book (WITH all the illustrations) of Aayis recipes! Thanks for your kind words Dee. 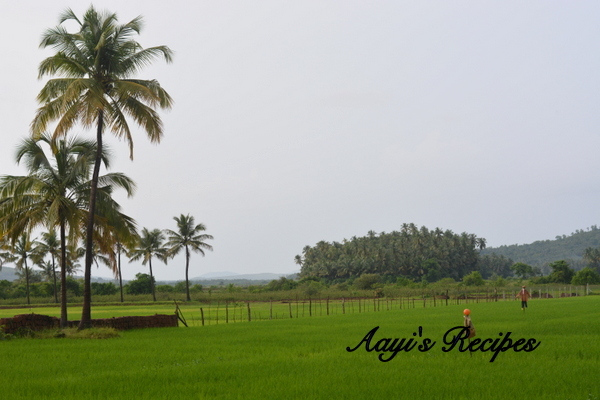 This is in the Konkan region of Karnataka, a small town called Kumta. 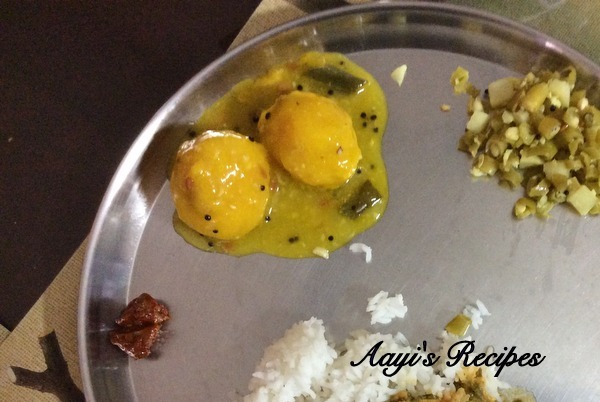 I am a regular reader of your blog but this post made comment for the first time in all these years 🙂 It reminded me of all the amazing food that I yearn for when I think of home. I’m from Sirsi and the Nayak hotel jalebis sure made my mouth water. They are absolutely delicious. Oh and the ghava laddus bring back so many childhood memories! Yummy recipes Shilpa 🙂 Even I am from kumta. So proud of your work! !